Post in 'Articles' started by webfish, Oct 18, 2015. Type #1 would be common in any single story construction. Regular black stove pipe is run upwards from the stove and connects with the Insulated Chimney at a special support box located immediately below the ceiling level. Insulated chimney is then stacked up until the required height is obtained. All chimneys must extend a minimum of 3 feet above the roof surface and 2 feet higher than any part of the building within 10 feet. Type #2 shows an “out and up” chimney, which exits through a wall and continues up along the side of the home. If desired, this chimney could be boxed in with wood framing and stuccoed or sided to match the home. Type #3 is similar to type #1 in that it is a single story installation, but different components are needed due to the slanted ceiling. In this case, the pipe is supported by a bracket at the roof level, and Insulated Chimney Pipe hangs down partially into the room to connect to the interior black stovepipe. The details as to the building of masonry chimneys are beyond the scope of this document, however there are a few safety and performance issue to keep in mind. It is commonly known in the Hearth Industry that 80-90% (or more!) of the masonry chimneys in the US are constructed improperly. The sad truth is that some masons spent so many years building low-temperature chimneys for oil burners, gas burners and fireplaces that the art of proper chimney construction has become almost lost. What’s wrong with most masonry chimneys ? These deficiencies can be addressed during new construction by a competent mason, and a properly designed and built masonry chimney is a work of art that can last for generations. An existing (but deficient) masonry chimney can often be brought up to spec by installing a UL approved stainless steel liner system. This provides an extra margin of safety as well as improves draft and simplifies cleaning. * The flue liner should be either a “cast-in-place” type (ask your hearth dealer) or other form of constructions which allows for expansion. What’d you say, Bunky ? You’ve got an fireplace or chimney which has sat unused and is just waiting for a stovepipe to be shoved into it ! Not so fast - some thought processes are required here. Lets start with the fireplace. In the “olden days” (yes, I was there), folks just shoved the stove in front of the fireplace, and stuck a piece of stovepipe up toward the damper area. If they were real smart, they fit some old fiberglass insulation around it so as to stop too much room air from escaping up the chimney (made the stove draft stronger too). Chimney professionals soon saw that there were a lot of problems with this setup. The stoves drafted poorly, created lots of creosote and the more-than-occasional chimney fires ! As a result of these problems, the Hearth Industry and the National Fire Protection Association put together a set of more modern guidelines. First, determine if you have a masonry fireplace and chimney. If you have a metal (zero clearance) fireplace and metal chimney, your options are very limited. Only a few inserts are tested for use in these “pre-fab” fireplaces. Check with your local Hearth Retailer - and confirm in the installation manual or manufacturers literature. DO NOT “FUDGE” A WOOD STOVE INTO AN EXISTING METAL FIREPLACE! * At the minimum, extend a 5 foot flexible stainless steel tube from your stove or insert up through the damper and into the first flue tile. * If the chimney is unlined, or if you want to do the best possible job, line the entire height of the chimney with stainless steel pipe the same size as the flue collar on your stove - typically 6” (see your Hearth Retailer). * Always have a cap (spark arresting, if possible) on the chimney top. Houses with unused chimneys tend to be older homes, as these structures were often built with multiple chimneys for heating, cooking, etc. Often, these older chimneys are not safe to use without some upgrading. They can be lined with approved stainless steel pipe or restored with special masonry processes (ask your chimney sweep). Pay special attention to the wall pass-through, which is the area where your stove pipe will connect to your chimney. Any wood or combustible material in this are must be cut back to comply with building codes. Special insulated sleeves are available to accomplish this transition. Single wall stovepipe is designed to connect a wood stove to a nearby chimney. It is available in different thicknesses (24 ga. or 22 ga.) and is usually painted with a high temperature black paint. Some manufacturers produce stovepipe in porcelain enamel colors to match their stoves. The reductions gained by these methods is usually 50% (9 inches). Heavier gauge pipe can be more difficult to cut, so these pipes use adjustable slip joints, which eliminate the need for trimming. When assembling your stove pipe use black furnace cement to seal between each piece. In addition, use three sheet metal screws at each joint in the pipe. Attach the pipe securely to the stove and chimney, assuring that it is rigid and tight. This is a double wall stovepipe with a stainless steel inner wall and a black painted outer wall. An air space in between the stovepipe walls serves as an insulating layer, allowing this special pipe to be as close as 6” to combustibles. Do not confuse this double-wall interior piping with the Class A Chimney described in the beginning of this document—this stuff is for interior use only ! Ask your Hearth Dealer for more information about this type of Stove pipe. My first experience with lack of proper floor protection came when I was homesteading in West Virginia. Our house had no central heating, but there was a fireplace ready to serve our heating needs. Even back then (1970) I knew that Fireplaces didn’t heat well, so I went to the hardware store and bought a $20. sheet metal woodstove. It didn’t fit into the fireplace, so I took the legs off and sat it directly on the hearth of the fireplace. That night, we lit a roaring fire and settled in for a peaceful winter eve. Suddenly, we smelled something burning !...smelled like wood. After a frantic search we discovered that the floor underneath the fireplace hearth was smoldering. * Ceramic Tile, Marble or Slate installed on top of UL Listed cement underlayment board (dura-rock and wonderboard are two brand names. Different stoves have different requirements, but all woodstoves need to have a non-combustible base underneath. This base should extend a minimum of 8 inches around all sides of the stove and 18 inches in front of any loading doors. In addition, the stove board should extend underneath and horizontal run of the stovepipe connection to the chimney. * Install approved non-combustible protection on the wall. The wall can be brick, stone, cement board or a UL approved stove shield, usually mounted on spacers with a 1” air space to the combustible wall. Check your owners manual or local building codes to determine the size of the wall protection needed. * Install a specially designed rear heat shield on the stove. 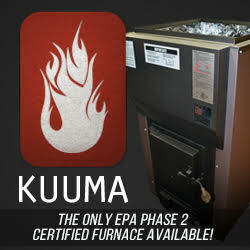 Check with your Hearth Retailer to see if a rear heat shield is available for the stove of your choice. * Every Wood Stove need a chimney—either a LINED Masonry or Class A (HT) Insulated Metal. You cannot use a Stovepipe through a window ! * Existing Fireplace Chimneys can be used if they are partially or fully lined with approved materials. Careful if you have a “pre-fab” or zero clearance fireplace - most stoves are not able to be used in this type of unit. * Most stovepipe should be 18” from a wall or ceiling - this can be reduced by the use of pipe heat shields or special double-wall close clearance interior pipe. * Non-Combustible flooring must extend under the entire stove, continuing for 12” past the sides and 18” in front of any loading doors. * Wall clearances can be reduced by using either a rear heat shield on the stove (if available as an option) or properly installed wall protection. Additional information on these subjects can be found on many areas of Hearth.com, Check the QA, the Wiki, the Informational Articles and even ask specific questions on our Forum! lostriver, mdrew, BoulderDash and 1 other person like this.